I woke up pretty late. A peek through the window showed me a perfect clear sky and a cat staring back at me on the roof. The scenery otherwise was rather urban, lots of different shaped and sized concrete houses continuing way back into the horizon. Today I was going to meet a Japanese internet friend, Yamauchi, who will come over to pick me up around 11am. It was too late to try the public bath (it closed at 10am), but I used the public computer so I could send an e-mail to the folks back home that I'm still alive. I also had a brief chat with a German tourist and tried out a massage chair(!) which really hit the spot after a tiring flight! Yamauchi-san showed up and we soon left the ryokan for some lunch at Kamata, since I didn't have breakfast. We went to one of Kamata's department stores where Yamauchi showed me different food types each restaurant had to offer. Japanese restaurants usually have a window display that show different kinds of food dishes skillfully made out of wax and plastic. I selected a restaurant pretty much at random as they all looked tempting and had Gomoku Yakisoba (stir fried egg noodles with vegetables and meat). It was delicious and this wouldn't be the last time I would praise the food in Japan. When we left the restaurant, the desk clerk gave us both a can of Chinese tea for having some lucky number we didn't know about (cold Chinese tea tastes awful, by the way). We then headed for Ginza, which was two train transfers away from Kamata station. Yesterday was a national holiday in Japan (culture day), but since it was on a Sunday, the free day wasn't wasted and was today instead. 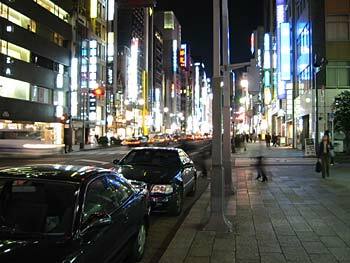 The main streets of Ginza were closed from vehicles and was turned into a walking street just like on any other Sunday. Outside one apartment store there was a noticeable crowd, who were eager to see a glimpse of some famous female model doing some promotion appearance. There was also a baseball team mascot entertaining people. The team itself - the Giants - had a parade elsewhere as they had won the championship earlier (baseball is very popular in Japan). Talking about sport, football was also popular and David Beckham was a big star here too. I bought some Japanese sweets from a street shop. One was called umekobu, a sea kelp which tasted really foul to be frank. We then went to a home electronics store called Bic P kan, as I needed a plug adapter for my digital camera so that I could recharge the battery. With Yamauchi's significantly better Japanese language skills I got the proper plug adapter and went to the cashier. Now in Japan you don't give the money directly to the clerk. Instead you put it on a tray in front of you.The clerk picks it up, takes the money, puts the exchange money with the receipt on the same tray and places the tray in front of you to be picked up. Sounds a bit awkward, but that's how it goes. Then the clerk put the plug adapter in a plastic bag and sealed it with a piece of tape. After this I found Yamauchi looking at some normal home phones she is considering to buy for her parents. When I wondered why should one buy a normal wired phone with all these cool mobile phones available, she said that with these phones you can send and receive e-mails too. Oh yeah, I forgot I was in Japan. 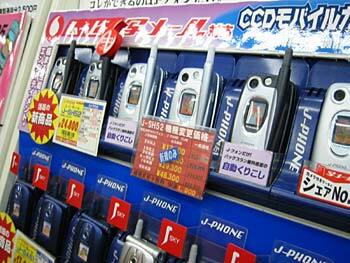 We also checked out the latest prices for some typical keitai mobile phones. The shocking thing for me was that the latest model with integrated camera, video and music playback etc. cost only 28,000 yen, that's like 240 euros! Yamauchi thought it was a very expensive model for a mere keitai. From the Kudanshita subway station we headed for the controversial Yasukuni shrine. The names of 2,5 million Japanese soldiers who died during World War II are enshrined there. What makes this controversial however is that it contains the names of some a-class war criminals. I didn't know it was the shrine that angers China and South-Korea before we passed a huge steel torii gate and I pondered did I really want to visit it, but I decided to have a look anyway. There were some parents with their children dressed up in a traditional kimono to receive blessings for good health and happiness from a shinto priest. These kids are also playfully known as shichigo-san ("three-five-seven"-san), because these are the ages the kids go through this tradition - they liked it or not. There were also some wooden prayer boards hanging near the shrine where people have written down their prayers. They mainly consisted of good health and passing school tests(!). 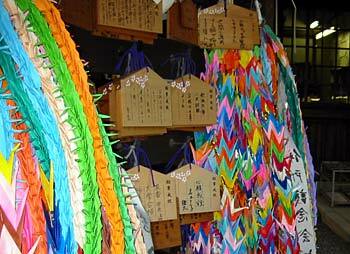 There were also some colourful paper crane garlands high school students usually make when someone gets sick. I bought a omikuji, a fortune that is written on a slip of paper. My fortune was that I would get “fair luck”. I tied it on a stand where others have put their own omikuji too. Later in my travels I've noticed that they are sometimes tied into branches of trees too, indicating they contained "bad luck". I also bought two omamoris, a small textile pouch that has a sealed piece of paper inside, which is supposed to bring good luck, protection from illness, etc. We left the shrine and took a lengthy walk through Budokan, past a science museum and the Imperial Palace (for some reason I didn't take a single photo of it >_<). After pondering different options where we should go next, we ended up going back to Ginza for a late dinner. We went to the Matsuya department store's restaurant floor and picked a sushi restaurant. Instead of barging in, we had to wait for our turn outside the restaurant. Because of this, there was a row of chairs where we could sit down while waiting (this turned out to be a typical cueing system among Japanese restaurants). 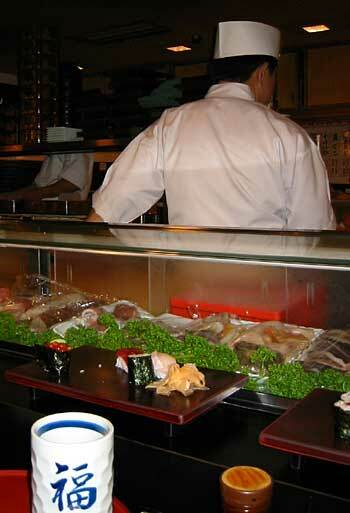 Once we got in, we were greeted by probably the whole staff while they were busy making sushi for the customers. We took a seat beside the chef counter, meaning that the chef made the sushi right in front of us. I was given a sushi list in English, so I didn't have to do anything else than just spell out the sushi I wanted and the chef delivered. If I wouldn't have reached my stomach's limits, I probably would have eaten sushi all night, as some of them were really good. While eating, I noticed that when one staff member welcomed or thanked a customer, everyone in the staff welcomed or thanked together. It really gave a cozy feeling to the atmosphere. After dinner we took a walk around the Ginza streets again, which unsurprisingly looked totally different after sunset. The same crowd hoping to see a glimpse of that model I mentioned about earlier were still outside the apartment store! We took a look at Hakuhinkan Toy Park, a multi-storey toy shop. Then we wrapped up the evening at Starbucks cafe, where we talked about various things of Finland and Japan. Yamauchi also kindly wrote down the places we visited today (without it I probably would have forgotten half of the places we visited). It was getting late, so Yamauchi had to leave. We went separate ways at the Shinbashi station, where she had serious doubts would I find my way back to the ryokan (women these days, I tell you...), but I easily found my way back to the ryokan and finally had a go at the public hot bath or furo. After a day heavily orientated on walking and still mildly suffering from the time difference, the furo was the perfect choice to ease the evening. After the bath I watched some Japanese tv-programs, which were actually quite terrible. It seemed like humiliating others on TV in a humorous way was the theme for tonight. Finally I fell asleep after a busy, but rich day in Tokyo (with that darn campaign song ringing inside my head I had to listen to while I was in Bic P kan). Ginza was a "pedestrian paradise" today, meaning that cars were not allowed in the main streets. 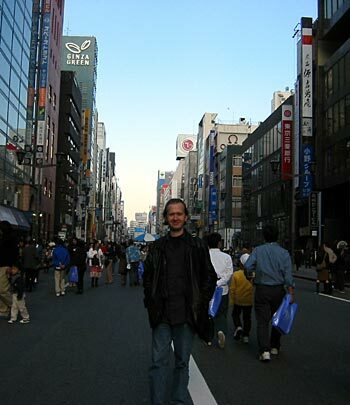 Yeah, that smiling gaijin is me. The latest keitai cost only 24,800 yen and boasted more features than a Nokia 7650. 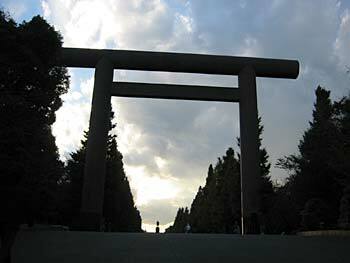 A giant steel torii leads to the Yasukuni shrine. 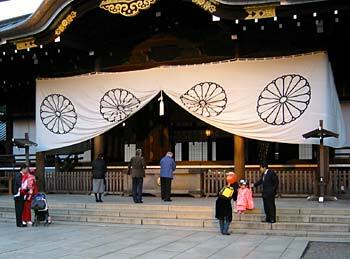 Many parents brought their kids to the Yasukuni shrine to be blessed by a priest for good health and fortune. Wooden prayer boards and paper cranes garlands near the shrine. 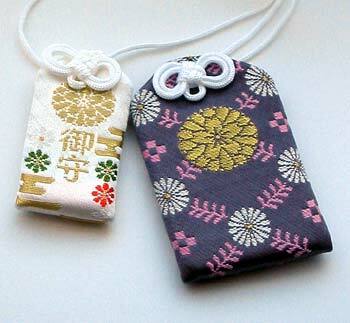 Omamori-amulets (o for great and mamori for to protect). Inside the small bag is a prayer or blessing written on paper. The chef (who unfortunately had his back towards us during this shot) made the sushi right in front of us. Yasukuni shrine - "Peaceful country shrine", where the names of 2,5 million Japanese soldiers who died during WW II are enshrined. Bic P kan - A big home electronics shop in Japan. Hakuhinkan Toy store - A big toy store at Ginza.